As I touched on in the first blog on this matter concerning the ICB and their statement on the takeover – Craig Whyte has not cleared Rangers debt. Instead it has been ‘assigned’ to The Rangers Football Group (Formally Wavetower). It is basically committed to another trust as opposed to being ‘wiped out’. This is not easy to explain in simple terms but I will give it my best shot. Basically Rangers still owe their debt (apparently approx. £18million) to the Bank of Scotland (Lloyds banking group). However, what has really happened is that the debt has been ‘paid off’ to Lloyds in the form of a lesser sum – let’s say for talking sakes that The Rangers Football Group/Craig Whyte/ Wavetower paid Lloyds banking group £12million pounds, or promised to. This means that Lloyds would get this sum of cash for no risk. It then means that Rangers Football Club would continue to service the debt – paying all sums of cash to Lloyds banking group who would then in turn give the money to The Rangers Football Group. Assignment of rights under a contract is the complete transfer of the rights to receive the benefits accruing to one of the parties to that contract. For example, if Party A contracts with Party B to sell Party A’s car to Party B for £10, Party A can later assign the benefits of the contract – i.e., the right to be paid £10 – to Party C. In this scenario, Party A is the assignor, Party B is an obligor, and Party C is the assignee. Such an assignment may be donative (essentially given as a gift), or it may be contractually exchanged for consideration. It is important to note, however, that Party C is not a third party beneficiary, because the contract itself was not made for the purpose of benefitting Party C. However an Assignment only transfers the rights/benefits to a new owner. The obligations remain with the previous owner. So what has this got to do with this MG05S form then? Well, basically it points out that all of Rangers assets would still be used primarily to pay off the debt owed to Lloyds banking group or more to the point – Rangers Football Group as the beneficiaries. It would also mean that should Rangers LOSE their Tax Case then HMRC would not receive a penny until the debt of Whytes group was met first of all. This is effectively a ‘Floating Charge’. A floating charge is a particular type of security, available only to companies. It is an equitable charge on (usually) all the company’s assets both present and future, on terms that the company may deal with the assets in the ordinary course of business. Very occasionally the charge is over just a class of the company’s assets, such as its stock. The floating charge is useful for many companies, allowing them to borrow even though they have no specific assets, such as freehold premises, which they can use as security. A floating charge allows all the company’s assets, such as stock in trade, plant and machinery, vehicles, etc., to be charged. The special nature of the floating charge is that the company can continue to use the assets and can buy and sell them in the ordinary course of business. It can thus trade with its stock and sell and replace plant and machinery, etc. without needing fresh consent from the mortgagee. The charge is said to float over the assets charged, rather than fixing on any of them specifically. This continues until the charge ‘crystallizes’, which occurs when the debenture specifies. This will include any failure to meet the terms of the loan (non-payment, etc. ), or if the company goes into liquidation, ceases to trade, etc. When the charge chrysalises it fixes on the assets then owned by the company, catching any assets acquired up to that date, but missing any which have already been disposed of. If the charge was created before 15th. September 2003 the debenture-holder is then entitled to appoint an administrative receiver, whose job is to collect the assets charged to pay off the loan. This is what is usually meant when a company goes into receivership. If the charge was created after that date, the debenture-holder may appoint an administrator. Most borrowing comes from the High Street banks, whose standard practice is to take an all-monies debenture; secured by fixed charges on any assets the company may have which will carry a fixed charge, and a floating charge on all other assets. This is the best security which can be created over the assets of any particular company. The bank may require other security from the directors and may want their personal guarantees. In the document that I will attach: HERE , it points out that Rangers Football Group have now excluded the money received from 23,154 – 27,017 season tickets for the next four seasons from the floating charge. I know my season ticket is approx. £450 per season. Some are more expensive, some are cheaper however if we use mine as the average then in simple maths e.g.) 100’000 x 450 = £45Million. This is a large sum of cash to look to receive up front. It is money that Rangers would then not have for the next four seasons. My only thoughts on this are that the sum of money has a stark similarity to that of the potential outcome from and HMRC case loss. Perhaps Rangers are prepared to pay the cash for their liability through this means? As I say, speculation. It is a possibility but one that only those further educated in these matters could possibly explore. If Rangers were to lose the major tax case then quite simply, everyone – with the exception of Craig Whyte would lose out. If Rangers were to go insolvent for instance (inability to pay one’s debts as they fall due and having negative net assets) then Whyte would hold all the major Ace cards: and this is perhaps why certain players have been given such long 5 year deals that have been hearing about all summer. A Receiver (A receiver is an individual appointed by a court or charge holder to take possession of property for its protection or realisation or appointed under the provisions of a statute.) would be appointed to Rangers on the basis of insolvency. As Whyte would be the qualified charge holder it is possible to be appointed by him. The players are under contract, and in simple contract law this contract law would not be broken unless one party fails in their obligation. In this case – rangers fail to pay the players wages. If Whyte and Rangers pay the players Wages their contract remains intact and they have a value that can be sold on. However, and this is the rather sneaky part if you like. If one of the players on the high end – long term contracts was a long term injury, or perhaps off form Whyte could then choose to not pay the contract and the player would become one of a long line of creditors that would not receive a penny. This leads to my suggestion that Craig Whyte is playing a very smart game with HMRC, with his manipulation of the Rangers takeover to date he is almost giving the fingers to them. HMRC will and have invested large sums of money investigating this case and bringing it to trial, but for what? Even if HMRC WERE to WIN the case against Rangers. At this point in time it is not clear that they would receive a penny at the end of the day due to the rather interesting stitch up played by Craig Whyte. So what are the real possible outcomes of this Tax Case? Broadly speaking there are two possible outcomes of this tax case. There are not particularly difficult to explain: Win or Lose. Of course this is a greatly simplified expression of terms. Yes, Rangers could win the case. The outcome of such would mean that there would be no further liability on the matter and that the whole situation would be dropped and Rangers would head on their merry way with a new owner in the shape of Craig Whyte that managed to acquire the club for the princely sum of £1 (An interesting value, one that means he did not require the ratification of other shareholders for example). The next step for Whyte would then be to either sell the club again for a profit or lead the club forward and reducing its costs to align the club on a steady financial football running at a break-even point. Idealistic – but a possibility none the less. The other main possibility for rangers would be to lose the case completely with HMRC looking for ballpark figures of around £30million with possible add-ons amounting to a further £50million. Speculative figures but at this stage it is all anyone can really do. If this were to happen Rangers would need to relay on Craig Whyte or someone else paying such a massive debt. Something that realistically is no going to happen and any suggestion that it ideally would, is sorely misguided. Liquidation is the main way ahead in this situation. Simply put, Rangers assets would be broken down and sold to pay the debts owed with Whyte’s group being the first to recover their investment as such. I don’t wish to speculate on what Rangers assets are worth at present but I imagine they would struggle to cover the liability owed to HMRC. There is potentially a third outcome and that is to strike a form of deal with HMRC. We have pointed out that HMRC would probably gain very little from Rangers Liquidation and therefore accepting another offer could be their only way to win out of the situation. It is possible that HMRC may take the precedent of winning the case and not follow up on forcing Rangers to pay but that is also unlikely. I would like to take this opportunity to again point out to anyone reading this that this information is broadly speaking an opinion i have formed myself. I realise that it could all be interpreted differently by others. That’s fine, i have never claimed to be an expert on the matter. just someone that THINKS he understands things a little better than some of the masses. None of this information is new or top secret, i am more than sure that these points have been discussed in far greater detail by others and this is in no way a reflection of their own work or endevours. I would also like to give a big LOL to some people who have accused me of being a BIGOT on this page. Brilliant, keep up the good work on that one. Whatever happens, one this is clear – HMRC need to try and save their face on this issue as they have vested such an interest in the matter? If they fail to – it opens massive floodgates on tax issues in the world of business and football. This entry was posted on October 19, 2011 at 22:57 and is filed under Glasgow Rangers, Tax Case. You can subscribe via RSS 2.0 feed to this post's comments. Can the author provide an estimate of how much tax revenue from the British state Rangers have dodged paying? Most Rangers fans are based in low income scotland, the club itself revels in being a bastion of scottish and british unionism. Yet, by dodging key tax payments, Rangers have contributed to this recession. They have contributed to a sluggish economy. They have contributed to sending old Rangers fans to the scraphead. They are the hasbeens. Young Rangers fans are the never weres. They never will have the chance at employment. At raising a family. At contributing to scottish and british society. Rangers were founded by four young men. What four young men in Govan now have a fair chance? Are Rangers implicit in this? And of course, this is before we begin on the decades on intolerance associated with the club, what ills have Rangers contributed to scotland in that respect? i await the author’s comments on these issues with interest. The questions you have asked are very subjective and on that basis the answers I will give will be perfectly channelled in that manner. I have tried to read the questions in a couple of different ways, using a number of different tones as to how they are implied or as genuine questions. I do this not because I am implying any ambiguity on your own behalf but rather than the answers you would receive on such matters may vary very very differently if posed on another format – let’s say for instance: Follow Follow. I may as well take your points one by one and give as honest a personal opinion as I can. At this point: none. Of course I know you refer to liability being found so I won’t dodge the question. I tried to answer this question in Part 1, it completely depends if the figures relate to pre or post tax earnings. In which case the figures, by my estimation, would be either £25million or £45million respectively. I acknowledge that this opinion is slightly obiter dicta in comparison to the next point that you go on to make. All that I would say is that the generalisation used in reference to ‘most’ could cover a wide range not completely subjective to Rangers but football fans as a whole. Obviously a broad spectrum of people support football clubs from those of vast financial wealth to those living in poverty such is the country that we live in. I like the point about Rangers being a club that ‘revels in being a bastion of Scottish and British unionism’ – first of all it would be very fair to say that Rangers revel in such circumstances as do Celtic in their Irish affiliation. Nether club would expressly admit to such but I would completely agree that both clubs do live and revel in such circumstances in reference to the masses. Before I answer the next part I am going to set out a stance to make it clear from what point of view I am coming from. I am a Rangers supporter. I define that as someone that supports the team on the pitch. I am not a Rangers apologist for any wrongs that they may or may not have subjected themselves to throughout their history nor am I an apologist for a vast array of their supporters that I am sure would give you a very different answer on the below points that I will make. In fact if you would like to witness an explosion of hypocrisy I suggest you aim some of those points in the direction of many on followfollow.com that will happily oblige in demented, uninformed argument. Have Rangers contributed to this recession? Simply the answer is: not really. It would be very far-fetched to suggest such implications. If Rangers are indeed found to have ‘dodged tax’ then a suggestion could be made that they do owe money to a British Government and by withholding such cash they have in some way contributed to a recession. If it were that simple. First of all, the recession involves such large sums of money and in such complex matters that the total of Rangers liability would pale into insignificance. Now, to explain that further I will give you the following situation: If I were to take £5 from your wage at the end of the week, would it leave you detrimentally short of funds before the next payday? The answer is completely dependent on your earnings. If you only earn £10 then it could be fair to say that it will. If you earn £300 then there is no safe argument that £5 would be judged to be detrimental to such. The problem here is that Rangers total liability is less than the equivalent of £5 from a salary of £10000 thus forth making any contribution so negligible that it would not be worth an argument. So, simply put – if found guilty then YES Rangers have contributed, but to no real level that it could ever be justified as significant. I hope that answers the rest of the point relating to youth employment etc. . . . The problems of the recession go much further than Rangers Football Club or even the contribution made by the literally thousands of EBT payments that are now under some form of investigation collectively. Let’s remember that EBT were not completely an illegal format and have been used by many businesses where no punishment can be proven or found. It is the manner of such that is important. Again, a bit extreme to be fair. Four young men in Govan have every chance in this world as do four young men from anywhere else in Scotland. Govan in itself is an area where opportunity may not be as instantly realisable as in more affluent places in Scotland – in theory of course it is as everyone is given the same chance in education in Scotland. Social and economic factors can play a pivotal role is how those opportunities are exploited. It would be a very bold suggestion to say Rangers are implicit on a lack of opportunity brought on by a worldwide Recession. Fair enough some air heads may believe that Rangers are the be all and end all of the world but in reality they are not and have no significance out with Scottish Football and therefore have absolutely no credentials to be laid bare as bastions of world problems. To suggest such would be ludicrous. Opportunity is dependent on much more than Rangers failure to pay what is in relative terms a negligible sum of tax contributions. Part of the problem, yes I think that would be fair to say – but no more so than the literally thousands if not millions of factors contributing to such. Probably about as clear an answer as I can give on that. Yes, but to no noteworthy extent. A very interesting point. I am going to presume this is in reference to Rangers former policy of not signing catholic players? If not then I apologise but for these purposes I will answer it as such. First of all, intolerance is not taught by football clubs and more than obesity is taught by the fish supper. What needs to be done here is a separation of society and football clubs. Was Rangers policy correct? Certainly not. It was wrong, it was racist; it goes against everything set out in relation to discrimination in the U.K and the E.U. and to be honest, paints Glasgow Rangers in a rather horrendous light. Have Glasgow Rangers moved on from this: of course they have. 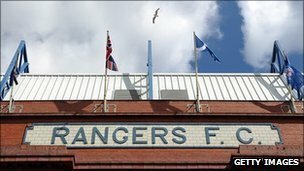 Many Catholics have played for Glasgow Rangers and therefore to suggest such should not be a slight on Glasgow Rangers as an institution but rather on a previous club hierarchy that clearly had an agenda that was a detriment not only to Glasgow Rangers the company but to society as a whole. I am sure many will give a nice reactionary answer to that question but as I have suggested it won’t be from me. Rangers fan, not apologist. In the days since the dark ages Rangers have been a part of many campaigns to remove racism and sectarianism from football and society. As have most clubs, Celtic also notably so. It is not Rangers or for that matter Celtics fault that such rank division still exists within society. Indeed the problem is evident among the support of other teams in the country: proof if it were ever needed that intolerance is SOCIETIES problem and something that needs to be stopped within the corridors of our own everyday lives rather than from within a footballing institution. As I stated at the start of this answer I have no idea how the questions were put. I don’t know you; I don’t know what team your support or your political views. No is any of that relevant to my answers. I’ve given you the answers as I see them – without any allegiance or with any vested interested in anything other than my own view. Clearly my views are not appreciated by some, as I state throughout many of my blogs I am far from welcome in many Rangers circles, indeed probably as welcome as I would be in Celtic supporting circles. Some see it as ironic others as laughable. Many football fans get upset in relation to their inability to express themselves with the freedom that they feel entitled to – then ban others from voicing theirs when they do not follow a general consensus. In overview, whilst I accept the exactitudes of your questions where a yes or no answer can be given I think the yes or no answers have to be taken in context to the whole situation. It would be true to say that yes; by leaving my bedside light on I am contributing to global warming. However that doesn’t paint the whole picture.